All tours are quoted in Malaysian Ringgit (MYR). Full payment must be received prior to the cruising date for all reservations. For group bookings, 50% deposit is required for confirmation, and final payment must be received 30 days prior to the cruising date. There is a 3% processing fee for payments made online and booked directly with North Borneo Cruises. Change the Cruise Session to Non-Cruising Package. 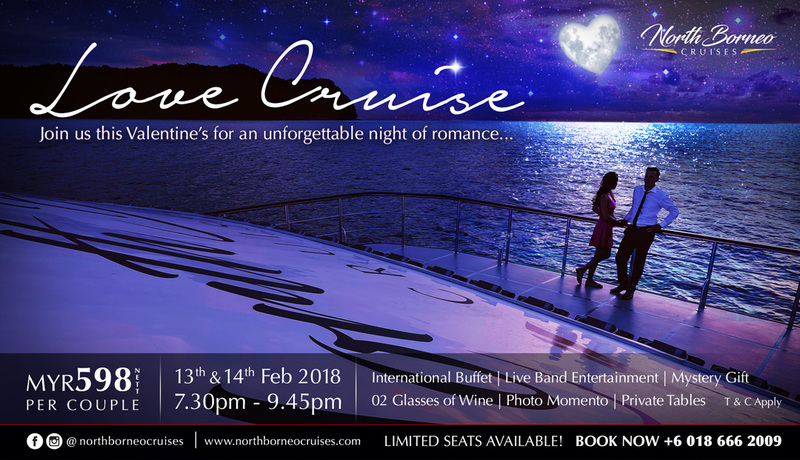 The Cruise session will be converted to a docked cruise session whilst still providing all inclusions of International Buffet Dinner and live band entertainment. There will be a partial refund for the package price difference. Cancelling the Cruise Session for Safety Reasons. North Borneo Cruises will not be responsible for any compensation. Note: Should the tour be able to proceed but the client later decides to cancel their tour, no refund will be made, unless client purchased the “Rain Check Basic” or the “Rain Check Flexi” Cover. Our "Rain Check Basic" Cover (no expiration date) allows you to reschedule your North Borneo Cruises tour 2 hours prior to the boarding time due to bad weather conditions. You have the option to join this tour at any future date. This cover can be purchased at MYR 20/person. Our Rain Check Flexi Cover entitles you to a full refund of your North Borneo Cruises ticket price (excluding “Rain Check Flexi” Cover fee) in the event of bad weather such as rain. It gives you the peace of mind. You will receive your refund within 14 working days after the cancellation of your tour. This cover can be purchased at MYR 38/person. However, North Borneo Cruises will continue to operate in rain or shine with the exception of extreme/severe weather forecasts whereby the marine department deems conditions unsafe for cruising. In the event where such severe conditions result in a cancellation by us, a full refund will be provided. Otherwise, cruising will continue as usual and no refunds will be made, unless Rain Check Flexi Cover is purchased. C. CANCELLATION DUE TO TECHNICAL FAULTS - In the event that the tour is unable to proceed due to technical faults or any issues which may put passengers at risk, North Borneo Cruises reserves the right to cancel the tour for safety reasons and will offer the options to postpone to an alternative date or a full refund. D. POSTPONEMENT OF TOUR - In the event that Client requires to postpone their tour for valid reasons, the Client must inform North Borneo Cruises AT LEAST 7 Days before the Tour Date. Furthermore, the postponed Tour Date must be within 1 month of the original Tour Date.